What is the most popular cookie flavour? I'm allergic to nuts, is it safe to eat your cookies? What nuts do you use in your cookies? Which flavours have nuts in them? If I buy a bucket of dough for home use, how do I go about making cookies from it? What do you recommend to scoop with? Can I make the cookies crispy? My cookies are burning on the bottom before the centre is cooked through, what can I do about that? How many cookies can I get out of a bucket of dough? How do I store the dough? 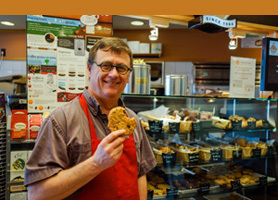 Do you provide the Cookie Delivery service outside of Metro Vancouver BC? What does "trans fat free" mean? Does this mean your cookies are "healthy"? What is your healthiest cookie? Do you have a low carb cookie or muffin? What's so special about fairly traded Organic coffee? Chocolate Chips & Chunks - hands down. We sell more Chocolate Chip cookies than all our other flavours combined! Also note, kids rarely like raisins in cookies. (If your kids do - congratulations!) When in doubt, go with chocolate chip cookies! All flavours are made in a facility where nuts and peanuts are used. We make every effort to keep the nuts separate and clear from the other flavours, but cannot guarantee that they will be completely nut-free. People with severe allergies should NOT eat our cookies. We use pecans, almonds, hazelnut and macadamias. We also use peanuts, which are not nuts, but part of the legume family. Some people have allergies in both these food groups, but being allergic to nuts does not necessarily mean being allergic to peanuts (legumes), and vice versa. The flavours with nuts in them are: Fraser Valley, Kona, Peanut Butter, Peanut Butter Milk Chocolate, Butterscotch Pecan, Milk chocolate Pecan, Macadamia Dark Chocolate, Macadamia White Chocolate and White Chocolate Almond Oatmeal. Also, we sometimes introduce new "cookie du jour" flavours, so be sure to ask before purchasing. If you are purchasing on behalf of someone else, check with them for any allergies. Simply scoop the dough onto an ungreased cookie sheet and bake at 350F/175C for approximately 15 minutes. As ovens vary in the way they bake, we recommend that you do a small test batch first. This "scoop & bake" as we call it, is very easy and economical, too. It's also lots of fun when parties inevitably end up in the kitchen! At Cookies of Course we use an ice cream scoop, but sturdy spoons also work well. Yes, for crispy cookies, flatten dough with your clean hand. Otherwise leave as a drop cookie on the sheet for a chewier texture. Try lining your tray with parchment paper (available in kitchen specialty stores). Use two cookie sheets, one stacked on top of the other (called double panning) - the air space helps prevent burning. You can also buy cookie sheets that are made of two layers with an air pocket in between. Each 4.5 Kg. bucket yields approximately 90 - 50 gram cookies (gourmet size) or about 150 "home size" cookies. We also have 2.5 Kg. bucket sizes available as special order and their quantities are about half those of the full size bucket. Reseal the bucket and keep refrigerated or frozen after opening. Yes. The price per dozen is the same, but we would need to confirm delivery charges, and delivery is typically overnight / next day service. It means the vegetable shortening we use - canola - does not have partially-hydrogenated fats (trans-fats) in them. Hydrogenated is the name for the end product of combining an unsaturated oil with hydrogen to produce a solid fat. This hydrogenated solid fat extends the supermarket shelf life of the baked good. Using non-hydrogenated shortening helps reduce possible health risks associated with trans-fats shortenings. Check out our Vegan Chocolate Chip Banana Oatmeal - other than the chocolate chips, all the ingredients are Organic, and we use banana puree instead of shortening so it's lower in fat, too. This flavour is available by special order only. Also try Oatmeal Raisin for fibre and Certified Organic raisins. We tried them out but they were frankly pretty awful and simply not up to the quality of our bakery items. 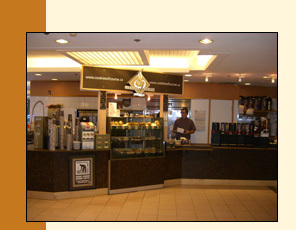 They were low sellers and our customers' feedback was that they want good tasting muffins and cookies, of course! Yes, we have a very popular rice flour chocolate chip cookie. But please note, our bakery is a facility where regular flour is used. Bottom line, it puts more money into farmers' pockets so they can have a better standard of living. Also these farmers use traditional shade growing methods for the coffee beans which means no clear-cutting, no erosion, no harm to animal habitat, all which protect the environment. Our Vancouver distributor buys his coffee directly from the co-operatives, mostly in Mexico and Guatemala - so the beans go from the farmer to the distributor here in Vancouver where he roasts them, and then to us. Only three steps in all! By reducing buying steps, our Vancouver distributor is able to pay the farmers directly which means more money and higher standards of living for them.